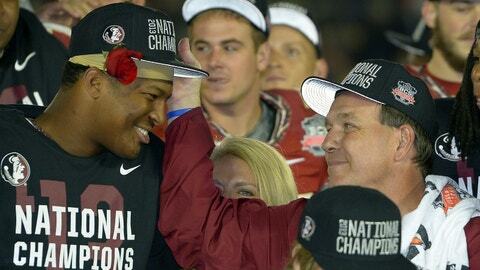 Florida State head coach Jimbo Fisher with Jameis Winston after the NCAA BCS National Championship college football game against Auburn. NEWPORT BEACH, Calif. — Florida State’s drive in the final 1:19 of Monday night‘s championship game is one that few college football fans will forget. Jameis Winston completed 6 of 7 passes as the Seminoles marched 80 yards, scoring on Kelvin Benjamin’s 2-yard touchdown catch with 13 seconds left that sealed a 34-31 win for the BCS title. Not only did Winston make up for what had otherwise been a rocky night with that final drive, but he also made amends for a disagreement with coach Jimbo Fisher that occurred at Florida Stateâs last practice in Tallahassee on Dec. 30. Fisher said he threw his Heisman Trophy-winning quarterback out of practice, sending him to the locker room over how they were handling a two-minute drill. "But the thing about it, though, and I say this, he waited for me to get off the field and we had a long discussion and we had it out," Fisher said. "He’s an unbelievable guy to be able to process and transition and go right back." Fisher places a heavy emphasis in practice on situations, putting the Seminoles through the two-minute drill, red-zone chances and third-down plays. So when he and Winston didnât see eye-to-eye on something, it concerned him. To Fisher, the two-minute offense is not about the quarterback but "using all the weapons around you." "He learned from it, he grew from it, and I grew from it. I grow from those situations how I handle it every time with those guys, too. Wish you didn’t have to do it, but I think it just made our relationship that much stronger and we understand each other that much more." 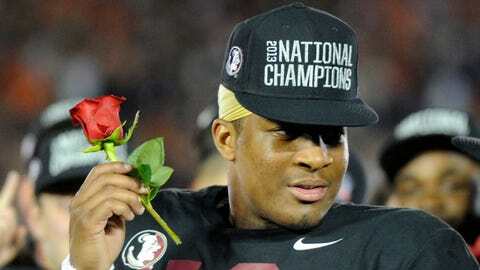 In the moments after Florida State defeated Auburn, Winston mentioned the incident in Tallahassee. He smiled at the irony of what he did a week earlier but also what he was able to accomplish in Pasadena. "That drive, like I say, it really wasn’t about me," Winston said. "He kicked me out of practice, and we won that game in two minute."